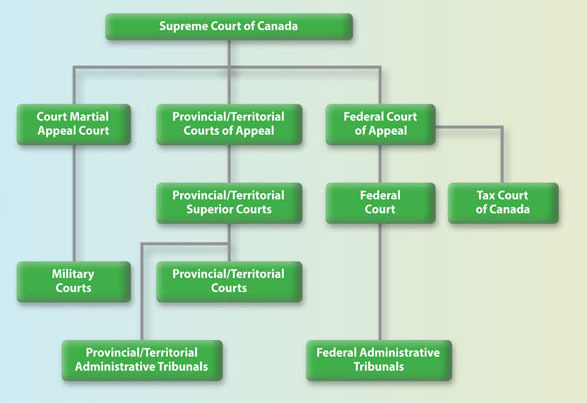 Here is an overview of the structure of the court system in Canada. This image compliments the definitions of the three legal systems used in Canada. It is within the court system that the three legal systems interact with each other and where conflict between them can arise. The highest court is the Supreme Court of Canada. It is made up of nine judges, three of which must be from Quebec to ensure that the civil law system is represented. The Federal Court specializes in areas such as intellectual property, maritime law, federal–provincial disputes, and civil cases related to terrorism. The Tax Court specializes in hearing appeals from tax assessments. The Federal Court of Appeal reviews the decisions of both these courts. The provincial and territorial court system is relatively similar in terms of practice. Nunavut differs in that the Nunavut Court of Justice has a single level trial court, as opposed to have three levels (lower, superior, and appeal) like other provinces and territories. Provincial and territorial try most criminal offences, financial, and family matters. Provincial courts can have specialized courts, including youth courts. The courts apply common law principles In Quebec, courts apply the Quebec Civil Code. Superior courts are the highest level of courts in a province or territory. They deal with criminal and civil cases. They have the power to review decisions of the provincial and territorial courts. The superior court is divided into a trial level and an appeal level. The trial level courts hear civil and criminal cases and the appeal level courts hear civil and criminal appeals. Administrative boards and tribunals handle disputes that do not have to take place in the courts. They are less formal, but are essential in resolving disputes in Canadian society. The decisions made in tribunals may be reviewed to ensure that cases are being treated fairly.